If you’d like to live like an islander, The Hammocks at Marathon, a Bluegreen Resort, offers the ultimate experience in Florida Keys living. As soon as you enter the lobby — with its glass panorama walls and 60-foot cathedral ceilings — you’ll be swept away by the Caribbean music, the sultry tropical foliage and the exotic saltwater aquarium that contains a rare, live coral reef. When you buy a Bluegreen Timeshare at The Hammocks, you’ll start adapting right away to the slow-paced, island lifestyle of our bayside resort. 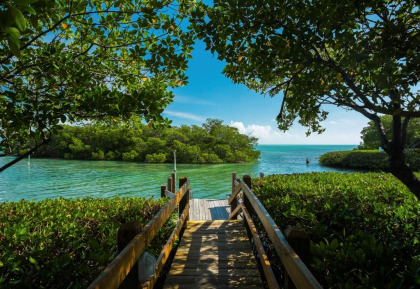 You’ll be surrounded by the exotic wildlife of the Florida Keys, enjoying the company of pelicans, herons and egrets, as well as the gulls that come circling ashore throughout the day. You’ll step aside for the geckos and iguanas to cross your path as you stroll down to enjoy the waterside view from the marina. Once you’re outside, you’ll be tempted to spend the day lounging in a hammock, letting the ocean breeze swing you gently underneath the palm trees. When you’re ready for a swim, there’s also a refreshing pool and a relaxing hot tub to soothe away the workaday world. Bluegreen Timeshare deals at The Hammock feature a selection of different types of accommodations, and you can choose between one- or two-bedroom villas, as well as convenient studios. No matter which you choose, each is fully equipped with everything you’ll need, including cable TV and a DVD/CD player, as well as household amenities such as a coffeemaker and microwave oven, an iron and ironing board and an electronic safe for your valuables. Studio units include a small refrigerator, while one- and two-bedroom villas come complete with full kitchens. In addition, each floor is equipped with a laundry room with washers and dryers that are free of charge for guests. Best of all, every one of our Bluegreen Timeshare deals also includes balconies and porches with spectacular tropical views. It’s easy to sell Bluegreen timeshares, thanks to BuyATimeshare.com. Whether you want to sell Bluegreen timeshares or buy a Bluegreen Timeshare at The Hammocks or at any of our other Bluegreen resorts, we’ll walk you through the process and help you find other interested buyers and sellers. Timeshare resale has never been as simple, and Bluegreen Timeshare resales quickly disappear once they reach the market. Even if you’ve never done a timeshare resale before, you’ll be surprised at how little time it will take for the process to be completed. At BuyATimeshare.com we specialize in Bluegreen Timeshare resales and deals to suit every budget. When you buy Bluegreen Resort's The Hammocks at Marathon, you’ll be able to take advantage of all the water sports opportunities that the area has to offer. Kayak, boat and Jet Ski rentals are available onsite, and you can also charter a fishing boat for a few hours or an entire afternoon. At the end of your day, follow the lit tiki torches along the path to Barnacle Barney’s Tiki Bar & Grill, an exotic, open-air tiki bar and grill that overlooks the beautiful moonlit marina. Our tiki bar offers a full dinner menu that includes classic dishes ranging from steaks to exotic seafood. If you just want to relax, the bar has two TVs and offers a full roster of beers, wines, bar favorites and frozen drinks. We have a traditional sunset celebration every evening here in the Keys, and at Barnacle Barney’s we celebrate too, with a cannon salute as the sun drops slowly below the sea line. We have other celebrations as well — including special events such as our monthly pirate invasions. When you buy Bluegreen Resort's The Hammocks at Marathon, you’ll find yourself the owner of a timeshare that offers a unique experience — a true exotic vacation that seems to take you far away from the rest of the world, yet offers all the modern conveniences and comforts of home. Contact Bluegreen Resort's The Hammocks at Marathon Specialist Today!